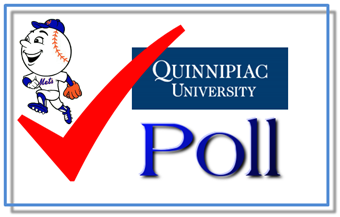 A new Quinnipiac Poll shows that more New York City baseball fans favor the Mets than they do The Bronx Embalmers. By a 45%-43% margin, residents of Baghdad-On-The-Hudson prefer the team from Flushing over the one from the Bronx. Statewide, The Pinstriped Posers still enjoy more support—by a 48%-34% margin (however, in 2012, the same poll found the Yankees ahead of the Mets 60%-22%). When isolating baseball fans in Upstate New York, it's a 53%-14% edge for The Evil Ones—with 9% of these folks actually supporting the Red Sox. The telephone survey of 1,605 New York State residents carries a margin of error of ± 3.6 percentage points.